Sorry, I said that, if someone called me “cupcake” I’d probably roll my eyes so hard I’d fall over, BUT if someone gave me a cupcake I might hug ’em. Maybe, I’m not a huge “hugger”, but I’d be thankful. #blessed. 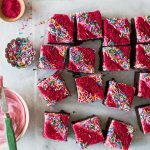 Wow, this is really getting away from me, so let’s talk about these pink frosted babes instead. Okay! I made these cupcakes for my long past birthday (I turned 32 almost 2 weeks ago!) and then got all weird and decided I wanted to make exactly one dozen, perfect vanilla cupcakes with chocolate chips in them and behold, 8 variations later, these are the results! These guys were directly inspired by the Big Top cupcake my favorite cupcake shop in Portland, Saint Cupcake. I ended up adding a smidge of almond to the vanilla batter and it really gives these tiny cakes a little extra interest. The cupcakes themselves manage to be finely crumbed, sturdy enough that they don’t fall apart when you tear away the paper, yet still fluffy. Basically, my cupcake dream. The frosting is an ultra silky, whipped cream cheese that I’ve tinted the palest pink because pale pink frosting makes my heart sing and these were my Bday cupcakes after all, despite them showing up very late to the party. Bonus, this recipe makes exactly 1 dozen, which also makes my nerd heart sing because I cannot stand it when you have to bust out an extra pan for 2 or 3 additional cupcakes #controlfreak. 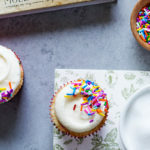 One dozen fluffy, chocolate chip studded cupcakes scented with vanilla and the teensiest bit of almond extract, topped with a swirl of pale pink cream cheese frosting and lots of sprinkles. Preheat the oven to 350°F and line a muffin tin with paper liners. In a medium bowl whisk the flour, baking powder, and salt. Set to the side. In a large mixing bowl beat the butter for about 30 seconds, until creamy and smooth. Gradually beat in the sugar. Once all the sugar is in the bowl, beat the butter and sugar together for 2 minutes until it begins to become pale and fluffy. Beat in the eggs, one at a time, scraping the bowl and mixing well after each addition. Beat in the extracts. Next, beat in ⅓ of the flour mixture followed by half of the buttermilk and repeat, ending with the flour mixture until everything is just incorporated. Fold in the mini chocolate chips. Divide the batter between the paper-lined cups, filling each about ¾ full. Bake on the center rack of the oven for 20 to 23 minutes or until the tops spring back to the touch and a toothpick inserted into the center of the cupcakes comes out clean. Cool on a rack for about 10 minutes before turning out to cool completely. In a large mixing bowl beat the cream cheese, butter, and salt together for 2 minutes until very creamy. Add half of the powdered sugar and beat for 2 minutes. Add the remaining confectioners sugar and beat an additional 2 minutes until the frosting is creamy, fluffy, and pale. Beat in about 1 drop of pink gel food coloring until it is completely combined. Frost the (completely cooled) cupcakes as shown by using a large closed star piping tip fitted into a piping bag, or just spread the frosting on the cupcakes with a small off-set spatula or butter knife. Decorate with whatever sprinkles you like. For the closed star piping tip, I used a size 9 Ateco tip. 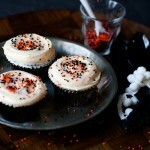 I use these edible star sprinkles from Wilton for decorating. This post contains an affiliate link, which means this blog gets a small commission if you make a purchase using the link. That just goes toward maintaining this site and making more tasty things for our eyes and bellies. Happy belated b-day! 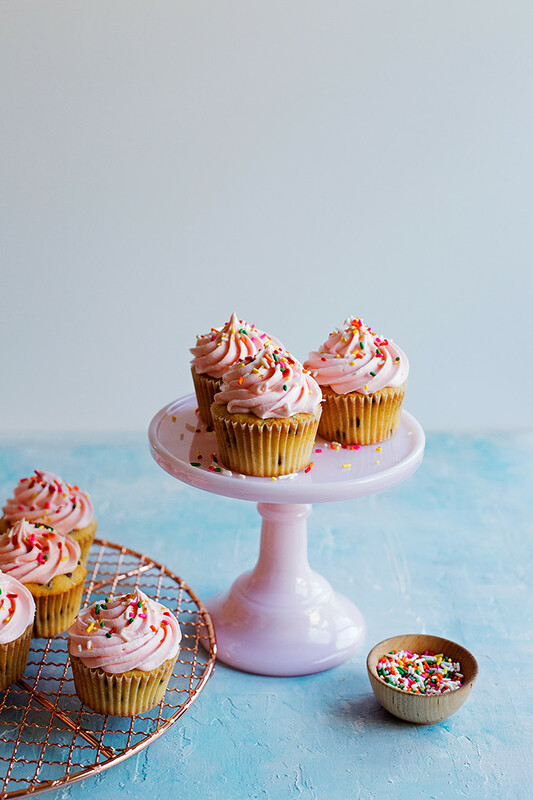 These little cupcakes are a perfect way to celebrate. 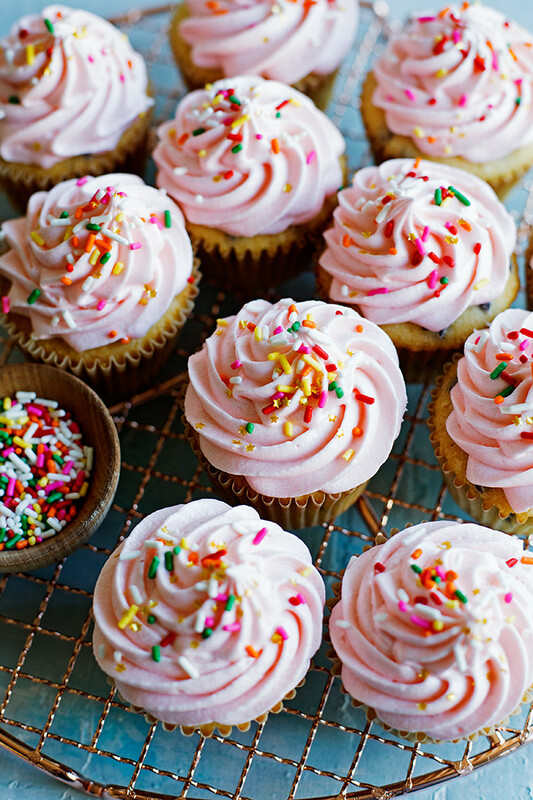 Love the pretty pink frosting! I don’t think I could possibly love these cuppy-cakes more!!!! Omg, so gorgeous, Girl! Firstly, happy belated birthday!!! I hope you had a lovely time! If anyone showed up with these cupcakes on my birthday, I’d be seriously happy. I love adding a touch of almond extract to cakes and sometimes frosting. It does add that little something special. And oh my gosh that cupcake stand is just the cutest!! Happy belated birthday! 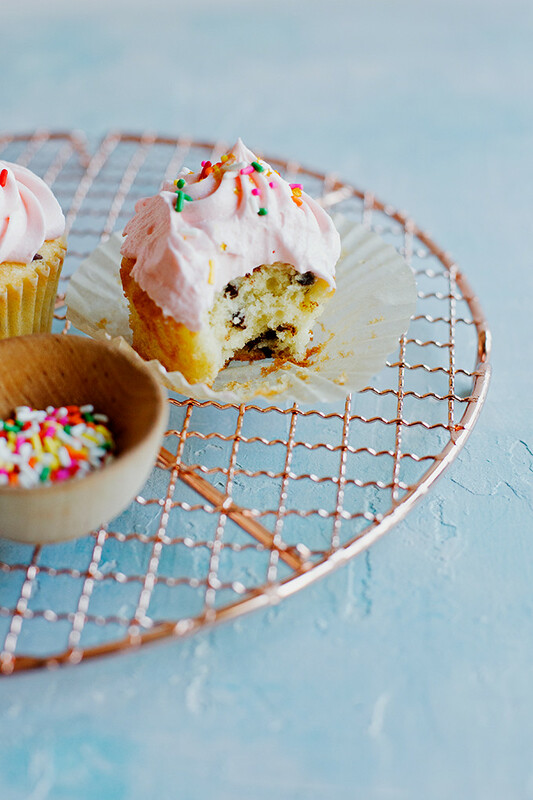 I’m into that bit of almond you added – these look like the most perfect birthday cupcakes! I’m kind of obsessed with this chocolate chip/cream cheese frosting combination!!!! 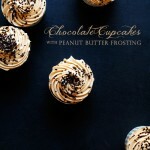 Ahhh…chocolate chip cupcakes sound amazing! What a fun way to sneak more chocolate in there! Happy birthday!! What a birthday treat these pretties are! The extracts go in after the eggs. Sorry about the confusion! !